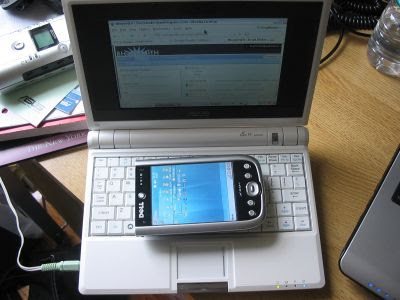 I took a few shots of the Eee PC next to my laptop and PDA. 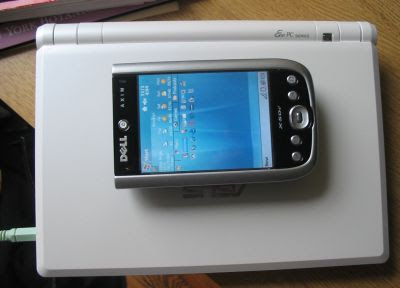 I won’t give you all the dimensions, but for reference’s sake, the Eee PC has a 7″ screen, while my Toshiba A135-4527 laptop with a 15.4″ screen and my Dell Axim X50v PDA has a 3.7″ screen. 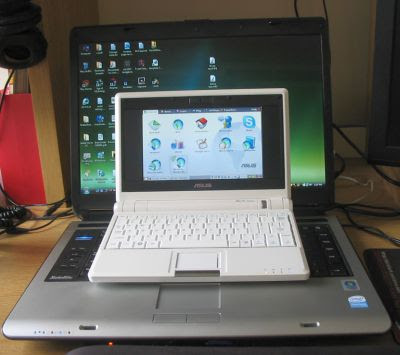 As you can see, the Eee PC is considerably smaller than my Toshiba laptop. The keyboard is cramped in comparison, but definitely usable. The biggest disadvantage to using the Eee PC (you know, besides less RAM, processor speed and storage space), is the smaller screen. Many web sites and applications fail to load properly. In fact, when I went to install the Gmail notifier plugin for Firefox, some of the check boxes were below the bottom of the screen. There was no way I could click on them. 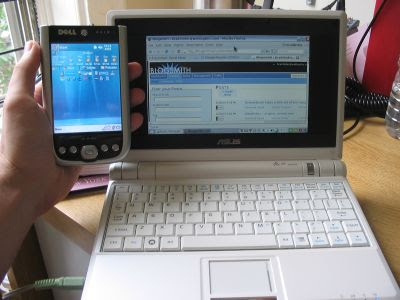 Compared to my PDA, the Eee PC might look huge at first, but looks can be deceiving. Check out the last picture in this series. Sure, you won’t be putting the Eee PC in your pocket anytime soon. But as PCs go, it’s pretty darned compact. OK, that’s my last update for tonight. I think. Stay tuned for a video walkthrough of the interface if I can get my digital camera to shoot that much video in one sitting. Sounds like web pages are poorly designed and that’s why they don’t render properly. Tell firefox to always display the vertical scrollbar.